Winner winner chicken dinner. Holy canoli what a run to the 'ship by Les Expos. Their shirts might be faded, but don't let it fool you. This isn't some expansion team, Andee, Charlie, Adam, Ricky, Cory and the entire squad made some incredible plays in the field...and a few funny comments. Don't forget Brock, who may make poor choices when it comes to NFL teams, but he was certainly playing kickball at a 5th grade level. 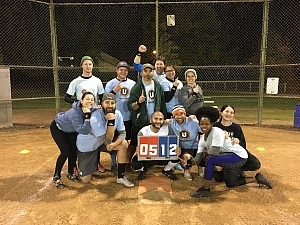 It was gonna take a team effort to win, and the Expos showed up on Wednesday night a cohesive unit. Stuck like glue, or gum to your shoe. Good job Expos and congratulations!